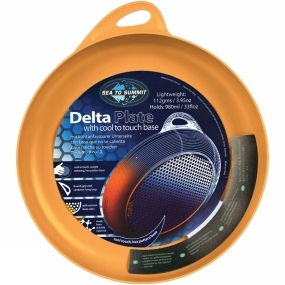 The lightweight Delta Plate features Sea to Summit's unique hex pattern base, which reduces weight and dissipates heat. The thumb grip keeps your fingers out of your food and also doubles as a carabiner hang loop. Specifically designed with steep side walls to keep food and liquids from slopping over the edge and making it easy to load your spoon with that last morsel of food.